When the 2018 U.S. Winter National Championships drew to a close, SwimSwam caught up with Micah Sumrall, multi-time 2018 U.S. National Champion in breaststroke and Golden Goggle Perseverance Award winner. Shifting focus away from the pool for a minute, Sumrall told us about a newfound hobby and talent she has developed: fashion design. Sumrall both designed and made her skirt and boots for the Golden Goggle Awards in New York City last month. Making clothing, Sumrall says, is both an engaging interest for her and it functions as a creative outlet and hobby outside the pool. Swimming wise, Sumrall has had a big year: at the 2018 US National Championships (summer), Sumrall won the women’s 200 meter breaststroke in a blazing fast 2:22.06, and then went on to win the gold at the 2018 Pan Pacific Championships in Tokyo, Japan in an even faster 2:21.88. Sumrall also raced in the 100 breast at Pan Pacs, where she placed fifth in 1:06.56. At the recent 2018 Winter National Championships in Greensboro, Sumrall won the women’s 100 meter breaststroke in 1:07.51, and then placed third in the 200 meter breaststroke in 2:28.76. Though the 200 was well off her time from July, Sumrall showed incredible closing speed in the 100 breast, where she split a 35.46 on the second 50, making her 6/10ths faster on the back half of the race than her next closest competitor, Sophie Hansson, who split a 36.08 on the returning 50 meters of the race for a final time of 1:08.14. At the 2018 Golden Goggle Awards in New York City, Sumrall won the Perseverance Award. At the 2016 Olympic Trials in Omaha, Sumrall finished 4th in the 200 breast, just 54-one-hundredths behind second-place qualifier Molly Hannis. 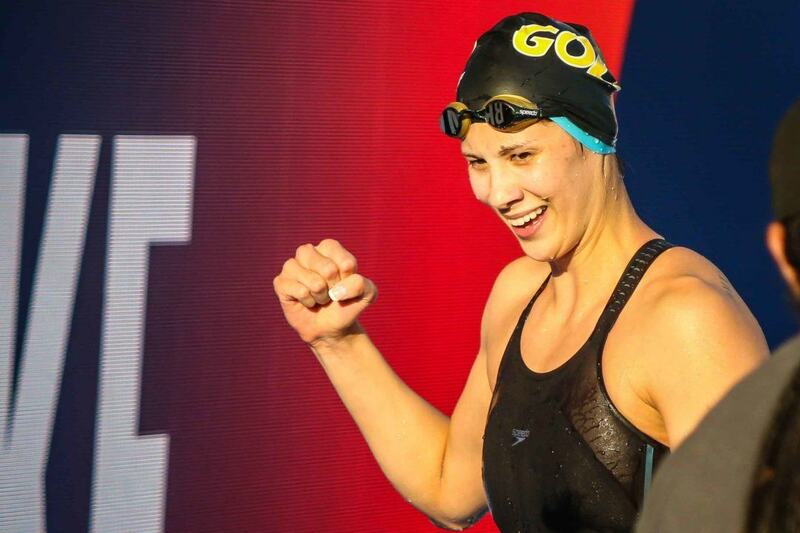 Though she at first speculated that the 200 breast in Omaha might be the final swim of her career, Sumrall pushed on and decided to continue through the next quad and go for a spot on the Tokyo 2020 Olympic Team. Ella Eastin, another nominee for the Perseverance Award, remarked that she is inspired by Sumrall on the award show red carpet. if you talk about her designing her own close and boots to the Golden Goggles Award ceremony why don’t you show it ????? I remember she wore a really sheer black lace dress with solid at the top of the bottom. Funny how I remember that small detail. It was pretty stylish. She may have a future in this field. I still say “Lawrence” in my head when they announce her, but my brain has accepted Dahlia.